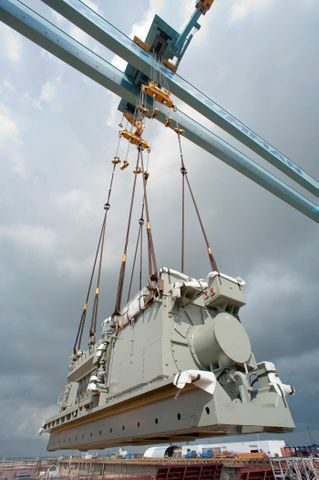 NEWPORT NEWS, Va., July 29, 2010 -- Northrop Grumman Corporation (NYSE:NOC) lifted two generators weighing over 195,000 pounds each into the aft section of the nuclear-powered aircraft carrier Gerald R. Ford (CVN 78), currently under construction at the company's Shipbuilding sector in Newport News, Va., yesterday. The diesel generators supply backup power throughout the ship in the event that power is lost. "Landing these diesel generators is a significant event for us and is just one example of the many major components the yard is receiving and installing in the ship," said Mike Shawcross, vice president of Newport News' Aircraft Carrier Construction program. " Ford is now about 11 percent complete. We continue to be committed to executing each phase of construction with a focus on first-time quality. We're excited with our progress and construction of the ship." Named after the 38th president of the United States, Gerald R. Ford (CVN 78), whose keel was laid Nov. 14, 2009, is the first ship of the new Gerald R. Ford class. The Ford class will continue the legacy of highly capable U.S. Navy nuclear-powered aircraft carrier ship platforms. Enhancements incorporated into the design include flight deck changes, improved weapons handling systems and a redesigned island, all resulting in increased aircraft sortie generation rates. It will also include new nuclear power plants; increased electrical power generation capacity; allowance for future technologies; and reduced workload for the sailors, translating to a smaller crew size and reduced operating costs for the Navy.